One of the things currently preventing smartphone manufacturers from achieving a truly bezel-less design without slide-out tricks or notch compromises is the popularity of front-facing cameras. Eccentric ZTE offshoot Nubia may have found an... interesting solution to that problem, releasing the Nubia X in China (and only in China) with no conventional selfie shooter. Don’t worry, there’s still a way to cultivate your narcissism, as this “full screen” bad boy also sports a secondary display on its back. The primary 6.26-inch panel with 2280 x 1080 resolution and a 19:9 aspect ratio is smoothly curved, yet accompanied by a small “forehead” and “chin”, nonetheless yielding a remarkable 93.6 percent screen-to-body ratio. The lower-res 1520 x 720 5.1-inch secondary screen, meanwhile, can be used for “HD selfies”, as well as wallpapers, custom signatures, “dynamic” pictures, and even various advanced controls for high-quality gaming experiences. The dual-screen Nubia X is entirely original (read quirky) as far as biometric recognition is concerned as well, including not one, but two side-mounted fingerprint sensors for convenient right and left-handed unlocking. Otherwise, this feels like a pretty standard 2018 Android high-ender, which is obviously not a bad thing. Power users get essentially everything they need here, from a Snapdragon 845 processor to 8GB RAM, up to 256GB internal storage space, AI-enhanced 16 + 24MP dual cameras, and (heavily skinned) 8.1 Oreo software. 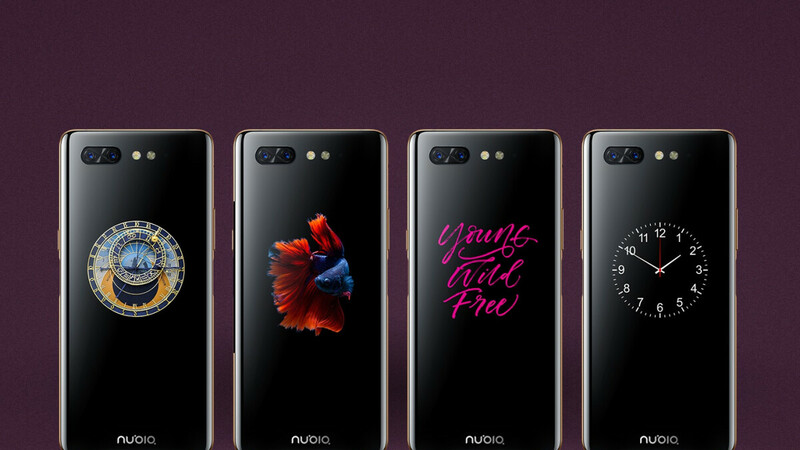 In its company’s homeland of China, the Nubia X will start at a fairly reasonable $475 or so (3,299 yuan) with 6 gigs of memory and 64GB ROM, going all the way up to CNY 4,299 (around $615) for a top-of-the-line 8/256GB configuration with a snazzy gradient blue and gold design. No words on international availability yet, and knowing Nubia, you probably shouldn’t hold your breath. Never heard of them but cool ideas. Phone looks great and nice to see they didn't get lazy with a notch, water drop or hole. You've never heard of Nubia? I'm surprised. They're excellent phones with top-notch cameras generally. I had a Z7 Max and loved it. This one looks very interesting but I just got the NexS so I'll be skipping this. Yep. Global version from a US vendor on ebay and shipped overnight. Just arrived a couple of days ago and it's been excellent so far. The battery life is unbelievable. Once iphone innovate how to put the not under the display then it would be stunning. There will be lots of OEMs to copy by then so Apple shouldn't have any problem. Is that why these OEMs didn't copy essential's notch but Apple's? Just make them phones look as close as an iPhone. Lmao iPhone has never looked this good. Ever. So Apple patented betta fish? Nice, real innovation for a change. Samsung needs to get busy suing these companies for coping their design, "a long rectangular device with rounded corners and curved sides on front and back glass". Oh, wait, it's only Apple that sues companies that have "similar looking" devices.